from: SHRINE ARISTOCRAT VEST Blue/Silver Tapestry Aristocrat Vest makes a grand statement of style for the bon vivant. Add a colorful cravat or towering top hat and party like it's 1899! 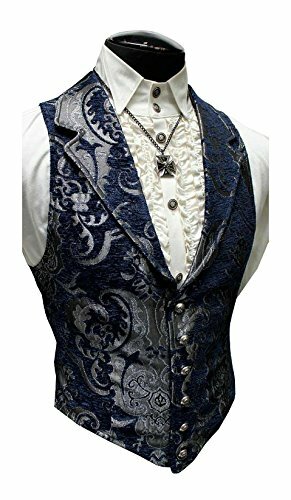 Cut from a rich blue tapestry fabric on the front, our waistcoat features a silver satin lining and back that ties with belting. The tapered fit comes to a single point in front and features six antiqued metal buttons fastening up the front. To maintain the slim silhouette, no pockets clutter the look. Exterior front made from a blend of 55% viscose and 45% polyester, lining 100% polyester. Made in the USA. Dry clean only. This vest runs small, so please look closely at the sizing chart SIZE/CHEST S/37" M/39" L/42" XL/45" 2XL/48"
If you have any questions about this product by Shrine, contact us by completing and submitting the form below. If you are looking for a specif part number, please include it with your message.